We invite you to touch and feel the most natural looking composite decking available. can create stylish and private areas in your home or commercial al fresco areas. whether it’s your home or a restaurant alfresco dining area. Installing a NewTechWood no maintenance deck allows you to enjoy your outdoor living space without the hassle of maintaining it. It will be a stylish, modern addition adding value to your home. NewTechWood fully capped UV resistant boards offer durability and longevity. Hidden fixings hold the boards in place as well as raising them up from the wall joist system, allowing air circulation between cladding and joists. Composite screening designed to handle the harshest of Australian conditions is the perfect solution for creating stylish and private areas in your home or commercial al fresco areas. Never worry about sanding or oiling like you would with real timber. Your fence will look good as new for years to come. A more natural looking alternative to aluminium slats. 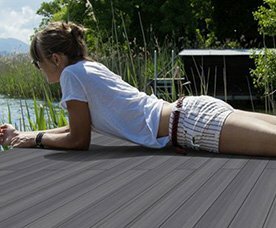 NewTechWood is a high performing composite decking that is quick and easy to install. Perfect for a backyard makeover! Perfect for DIY-ers! 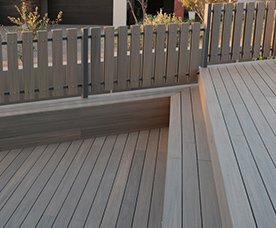 NewTechWood® is a pioneer in the development and manufacture of outdoor composite wood decking, wall cladding, fencing, screening, and garden furniture. 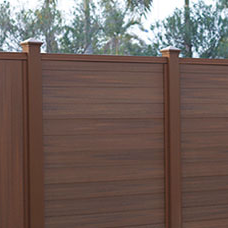 Since 2004 NewTechWood® has been at the cutting edge in WPC (wood plastic composite) technology, developing products that bring beauty and practicality to your outdoor living experience. The secret to NewTechWood’s success is that we are responsive to our customers, contractors, home builder, architects and homeowners and we provide the materials to make their visions are a reality. NewTechWood’s foundation was built on green principles and values. Our parent company has been recycling plastic materials for almost 30 years. Our products are made from 95% recycled materials, including reclaimed wood fibres and high quality recycled plastic. 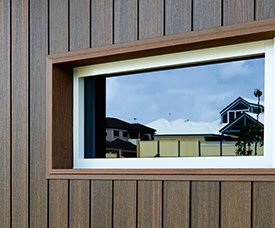 NewTechWood is proud to provide its products to Australian homeowners. NewTechWood for a Better Australian Outdoor Life. In 2010, NewTechWood® began a project to design and formulate the most durable, most attractive, and most reliable composite deck and cladding board in the industry: NewTechWood®. Several years of engineering and countless hours of field-testing has yielded a product of unmatched performance and beauty. NewTechWood combines the proven strength of high density polyethylene plastic and wood fibres with an outer shell of polymer that completely encapsulates the board in an impermeable layer of protection from scratches, stains & fading. NewTechWood is a TRUE GAME CHANGER in the composite decking industry. Conventional wood plastic composites are a thing of the past. Urban Direct Wholesale is the Australian distributor of NewTechWood’s product range. We have selected these products because of their suitability to Australian conditions and building standards. To discuss your house or project plans book a free consultation with us at our Home Base Subiaco display. Free samples are available from our ground floor stand #188 at Subiaco Home Base. We are proud members of the Housing Industry Association and support its promotion of high standards in the building industry. In conjunction with our 25 Year Limited Warranty, you can rest assured you’ll be receiving the utmost care and quality when purchasing NewTechWood products. If you have any questions about the products or require more technical information please contact us. I really enjoyed working with the product. It was easy to cut and work with – the clipping system makes it very easy to install, in fact installing the decking was actually the easiest part of the job! Once it was completed, it looked amazing! I would recommend this product to anybody who is looking at either installing a new deck or redoing an existing deck. The best part of it is, no sanding or staining ever again! We created a small but effective composite decking usingNewTechWood in Teak. The material was really good to work with – highly recommend! We added another section to it 6 months later and you couldn’t tell the difference between the brand new deck and the 6 month old one.Thanks again and we look forward to working withNewTechWood more in the future. TheNewTechWood Decking is looking great and proved easy to install even with my limited skills. My friends have commented on how good it looks. Franz Building Supplies has chosen to sell Newtechwood because of its unique price point, aesthetics and the customer service at Urban Direct Wholesale. To anyone who is looking for a quality decking board. I highly recommend this product. Great look and very durable.